Doodle simplifies scheduling a meeting with several attendees. 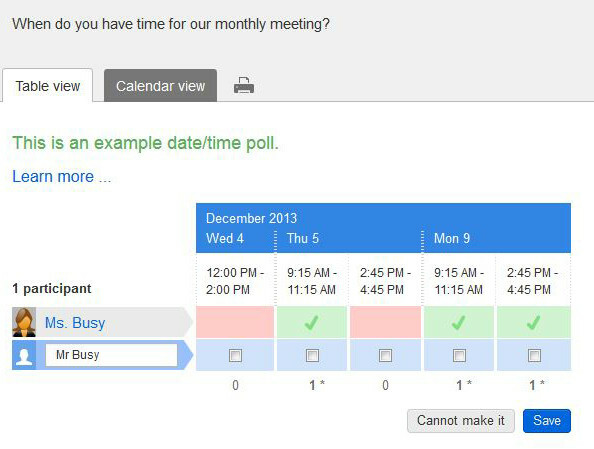 Instead of the back and forth emails, create a Doodle poll with the possible meeting times. Attendees simply check off the dates/times that work for them. Once your address has been white-listed, please create/activate your account. Login at https://pennlaw.doodle.com after your account has been created and activated. Note: Doodle may delete outdated polls from time to time, but no earlier than 30 days after the last date in the poll, or 30 days after the last access to a poll without dates. View Details.